Christmas can be a time of great stress, or a fun time of celebration with family and friends. If you’re in search of ideas for inexpensive family fun this holiday season, look no further. We’ve prepared a list of 25 activities suitable for the whole family. Send Christmas Cards: Get the whole family involved! Let little ones apply stamps and seal envelopes. Make sure you have them sign their own names too. Decorate the Tree as a Family: Yes, it might not look as professional, but letting the kids help decorate the tree creates family members you’re sure to treasure long after the tree is gone. You can always rearrange some of the ornaments after the little ones are asleep. String Popcorn and Cranberry Garlands: This old-school Christmas decoration is great fun to make. Remember to buy extra cranberries and pop extra popcorn so you can snack as you string. String them up outside for the local wildlife to enjoy, and add a pop of color to outdoor bushes and trees. Make Paper Snowflakes: Remember those old paper snowflakes you made as a kid? Break out the scissors and cut out a snow storm. Hang them in the windows or from the ceiling in your child’s room to create an indoor winter wonderland. Go Ice Skating: An outing to a local ice rink (outdoors if you’re in a cold climate) is always a fun time for families to enjoy together. Attend a Christmas Concert: This time of year, brings a multitude of concerts celebrating the season. From big name bands and full symphony orchestras to local school and church programs, there are plenty of options to choose from! Christmas Lights Tour: Bundle up and take a walking tour of the neighborhood, or pile everyone in the car and search out lights displays. Ooh and ahh over the lights and decorations, and rate your favorites on the way home. Write a Letter to Santa: In addition to being a great way to get gift ideas, helping the kids write letters to Santa is a fun and educational activity. The post office will even deliver a letter from Santa back to your child if you like! 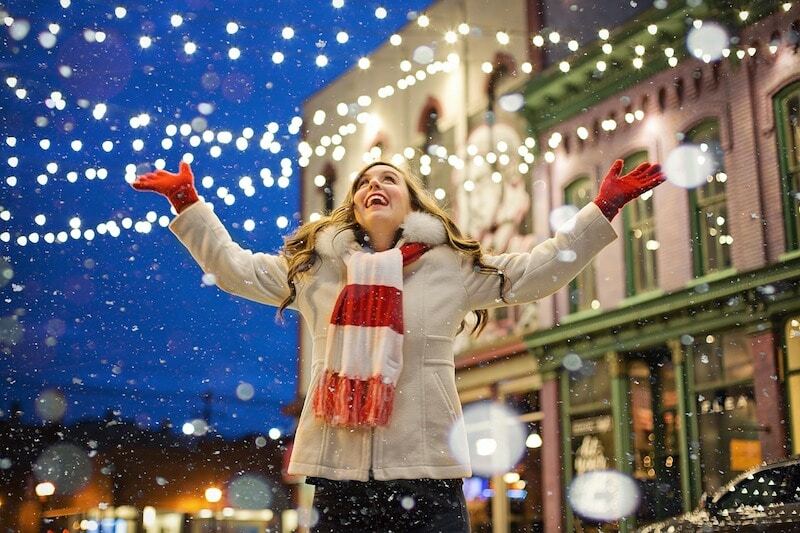 Attend a Tree-Lighting Ceremony: Attending a tree lighting ceremony is a great way to get in the holiday spirit. What could be better than enjoying a huge, beautifully decorated Christmas tree? As a bonus, many ceremonies also include visits from Santa, hot cocoa and treats, or Christmas carol singalongs! Give Back to Those in Need: The holidays are a great time to give to those less fortunate. As a family, serve at a soup kitchen, donate gently used toys to charity, or find other ways to volunteer and/or give. Encouraging young children to help others can be both fun and rewarding! Celebrate Christmas Past: We’ve all heard the story of Scrooge and his ghostly Christmas visitors. Take some time to celebrate Christmas past with your family. Tell your children about what Christmas was like when you were a child. Look through old photo albums of Christmas pictures, or reminisce about prior years’ celebrations. Bake Cookies: Holiday baking is a time-honored tradition that brings families together. Little ones can help mix and decorate. You can even turn it into a cookie baking party if you so choose! Deliver Holiday Cheer: Grab your Santa hats and take some of those baked goods, or homemade Christmas cards and decorations, to someone who could use a little holiday cheer this season. Surprise Grandma and Grandpa, or drop in on a neighbor who could use a little pick-me-up. Even a grinch is sure to smile! Have a Candy Cane Hunt: Kids love Easter Egg Hunts. Why not try a candy cane hunt at Christmas time? Hang canes from bushes and low tree branches. Tuck them into outdoor decorations. Have fun with it! Make Gingerbread Houses: Pick up kits or bake your gingerbread from scratch. Have each family member put their own personal touch on the decorations for their house. Then post pictures online and have family and friends guess which house is whose. Go Caroling: The idea may bring to mind images of Victorian England, but caroling is just as fun today. Grab the kids, extended family, and friends, and anybody else you can scare up and go sing Christmas carols. If you’re not sure your neighbors will appreciate it, contact your local nursing home or hospice to see if you can bring a little festive fun to those who need it most! Enjoy Hot Chocolate by the Fire: With all the busy things to do for Christmas and holiday events this season, it’s good to enjoy some time at home to just slow down. Gather the family around the fireplace for some hot chocolate and just spend some time together. Make Pine Cone Bird Feeders: It’s simple to make treats for our feathered friends to enjoy, even for preschoolers. Roll a pinecone in peanut butter, then in bird seed, and string it up outside. Place your bird feeders near a window so you can watch the birds enjoy their treats! See the Nutcracker Ballet: Make plans to see a local production of the Nutcracker Ballet or tune in to a televised version. It’s a fun way to expose children to ballet and the fine arts! Classic Holiday Movies: Get the whole family together for some quality time in front of the television with classic holiday movies and Christmas specials. Need some inspiration? Check out Parents’ list of Holiday Movies to Watch with the Kids. Pop some popcorn, cuddle up on the couch, and enjoy! Attend a Christmas Parade: A parade is sure to bring out the child in all of us. If there isn’t a local parade to visit, consider traveling to the closest city that has one, or watch one on tv or the internet. Have a Snowball Fight: Let’s be honest. Snowball fights are just plain fun. If you happen to live in an area where a White Christmas is unlikely, check out this recipe for Fluffy Stuff – it’s almost as good as the real thing! Christmas Around the World: It’s easy to get caught up in our own local traditions and activities, but Christmas is celebrated different ways around the world. Learn about how another culture celebrates Christmas, and maybe try some of their traditions. 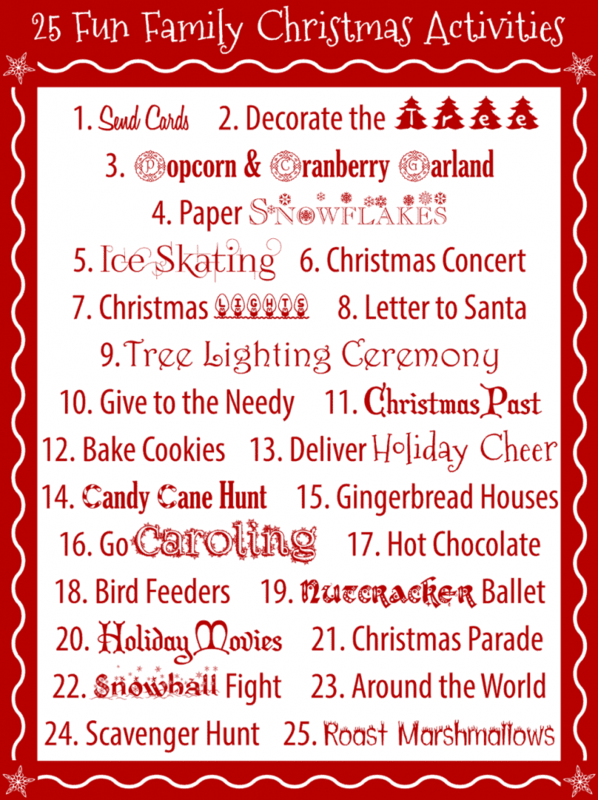 Christmas Decoration Scavenger Hunt: Make a list of classic symbols of Christmas (Santa, snowmen, bows, candles, gifts, trees, etc.) then go out into the neighborhood and search for each item on the list. If your neighborhood doesn’t decorate, try this at a local shopping center or anywhere else that’s festively adorned. Have family members take funny pictures with each find and put together an album to enjoy in years to come! Roast Marshmallows Over a Fire: Roasting marshmallows warms the spirit as well as the body. If you’re in a warmer climate, build a firepit outdoors. If it’s cold in your area, roast them over the fireplace, or over candles at the kitchen table (with the lights out of course!). Print out the graphic above and stick it to the fridge or another prominent place. Cross off each item as you complete it, and enjoy some quality time with the whole family this holiday season! For even more fun family ideas, check out the list from Country Living. Looking for ways to save on Christmas decor and fun? Check out our coupons and promo codes for Tom Smith Christmas Crackers and Christmas Tree Shops! And from all of us at Official Coupon Code, we wish you the warmest and happiest holiday season!